Vertigo, megrims, or giddiness may be associated with organic disease of the brain, or be occasioned by derangement of the liver or other organs of the digestive system. A fit of vertigo may also arise from the action of the sun's rays upon the unprotected head, or it may be clue to the retention of blood in the vessels of the brain consequent upon pressure of a tight collar. A single attack, which may occur at any time during a journey, is sometimes difficult of explanation; when a hot sun and a tight collar are both present they will naturally be looked upon as the cause of the fit, but in the absence of either it will be impossible for anyone to decide whether it was due to some chronic disorder in the brain or to derangement of the digestive organs. In these cases a direct diagnosis is only possible when the history of the animal is known. It may, however, be suggested that a sudden and violent attack, under the influence of which the horse suddenly stops, raises and shakes his head, and then drops down in a state of partial unconsciousness, is most likely to be consequent on some cause which is acting at the moment, such as heat, pressure on the vessels of the neck, or some acute disturbance of the liver. Vertigo which arises from organic disease of the nervous centres, is in most cases a disorder of gradual development. 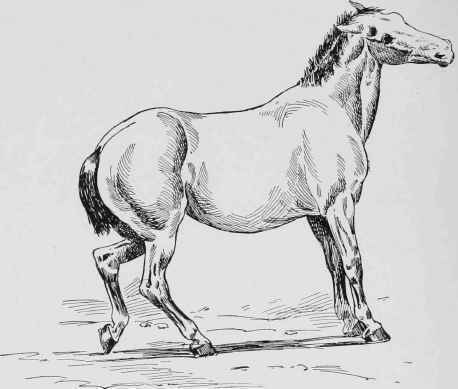 The first attack is extremely slight, and probably attracts very little attention; the driver may notice that the horse occasionally shakes his head, or turns it to one side as though he were annoyed by something which had entered the ear; after a short time the animal ceases to behave strangely, and finishes the journey without any further indication of disturbance. Nothing more may be thought of the matter until the recurrence of the attack after the lapse of a week or more, and even then no suspicion of megrims is probably excited until a more severe attack occurs. Fig. 178. - Vertigo or Megrims. Post-mortem examinations have been made of horses which have suffered from chronic vertigo, the fits occurring at intervals of a few weeks or months during several years of the animals' lives. The results of such examinations were in some cases unsatisfactory; in others calcareous nodules and tumours, varying in size from a pin's head to a pigeon's egg or larger, have been found in the plexus of vessels in the lateral ventricles of the brain. Frequently, however, the search for morbid appearances in the brain and spinal cord has been attended with disappointment. 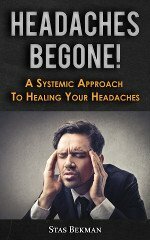 Attacks of vertigo may sometimes happen in consequence of injury to the head; a blow accidentally or intentionally inflicted may produce slight concussion, or may even result in the depression of some of the bones forming the cranial cavity, in which case stupor will result, and will continue until the depressed portions of bone are elevated by means of a surgical instrument. When the injury is slight, the fit of giddiness which follows generally passes off in a short time and leaves no trace behind; but the rider or driver, being probably unaware that the animal has been struck on the head, is disposed to look upon the attack as a case of megrims of the ordinary kind. The fact, however, of the attack not recurring would be a sufficient evidence that the injury is not permanent. As the occurrence at irregular intervals of fits of vertigo is at the least annoying, and cannot be said to be unattended with danger to the rider or driver, it is naturally a subject of enquiry as to what can be done in the way of prevention. If any positive cause, such as a tight collar, is detected, the remedy is of course perfectly obvious. Should symptoms of disease of the liver be present, a dose or two of aloes with calomel may be given with benefit; but if there is no obvious cause, the conclusion will necessarily be that there is some morbid condition of the central nervous system, and beyond attending to the animal's general health by judicious feeding and properly regulated work or exercise, nothing can be done. Horses suffering from chronic brain disease should never be hurried or called upon to undergo severe exertion. Moreover, they should be fed two or three hours before being employed in any kind of work, and food should be given in small quantities and often.